Karin Sörvik is a Taoist Minister and Senior Instructor and Senior Teacher with the Healing Tao System. Her first career was in dance, theatre and music, earning her degree in acting from the Escuela Nacional de Arte Dramatico. Most of all she loved the magic/spiritual space that's created during a performance. To further her search she began to look into Eastern methods. She studied Tai chi and I Chuan with Master Tung Kuo Tzao in Argentina and became a Taoist Minister with D.A.R.I. She also won several Tai Chi Chuan competitions in South America. She moved to the US in 2001 to serve the Taoist community and to further her practice. She studied with several Taoist Masters: Ron Diana, B.P. Chang, Dr. Sthephen Chang and Master Mantak Chia. 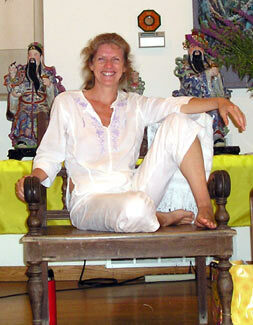 Karin Sörvik is currently the Director of the Healing Tao Center and Tao Healing Arts.com. President of the HTIA and member of the Council of 9 of the UHT Foundation. Founder of the non profit Healing Tao Society. She is a practitioner and counselor in Taoist Healing Practices. Practices include: Tao Yin (Taoist Yoga), Nutrition, Herbology, Meditation, Tai Chi, I Chuan, Chi Nei Tsang and Chi Kung Therapy. She has been teaching for the last 15 years in Europe, Latin America and the US.